This “full support” men’s health formula contains 5 scientifically-proven ingredients that ease the age-related issues many men experience. The potent ingredients in Pro-Forta Men are specifically designed to address the low energy, reduced muscle mass, occasional bothersome aches, and more frequent bathroom visits that can occur in men past 40. I specifically designed Pro-Forta Men to help naturally address many of the age-related issues my male family members and friends were going through. Pro-Forta Men is an advanced formula that contains what I consider the most important ingredients men need, especially after age 40. These compounds help revitalize diminished energy levels, sharpen cognitive function, and ease many of the occasional aches that come with getting older. 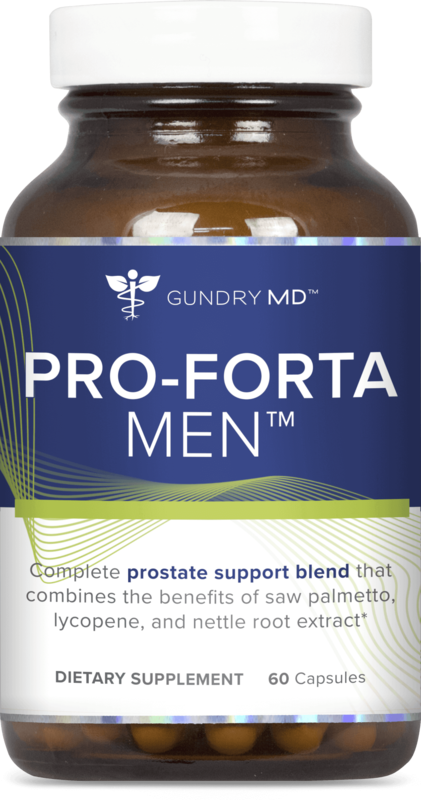 Gundry MD Pro-Forta Men is perfect for men who want to live a stronger, healthier, more active life. Pro-Forta Men is an advanced “full body” support supplement, and is ideal for natural healthy aging for men. Gundry MD Pro-Forta Men contains only 100% natural and pure ingredients. The formula is tested for quality and purity at an independent, 3rd-party facility. However, as a physician I recommend consulting with your own health care provider before beginning any new supplement, especially if you currently take prescription medication. I’m in my 50’s and have tried other combinations of products. Dr Gundry hit the mark with Pro-Forta Men which has aidied in urinary flow and the male issues he describes as long as you drink the enough water. This is a great product and I recommend it. Don’t wait, give it a try.